The stylized landscapes of Jon Jay Cruson will be featured alongside the playful ceramic figures of Robin and John Gumaelius in June. Join us for a reception for the artists on Friday, June 1st 5-8 p.m. during Ashland’s First Friday Artwalk. Show runs June 1st – 29th. Jon Jay Cruson is a true West Coast artist. His paintings, stylized shapes, patterns and colors, are the result of much time spent studying the Pacific Northwestern landscape. His style is unsullied by trends or fashions. While remaining representational, his paintings tend toward the abstract, a double pull that is one source of the creative tension in his work. 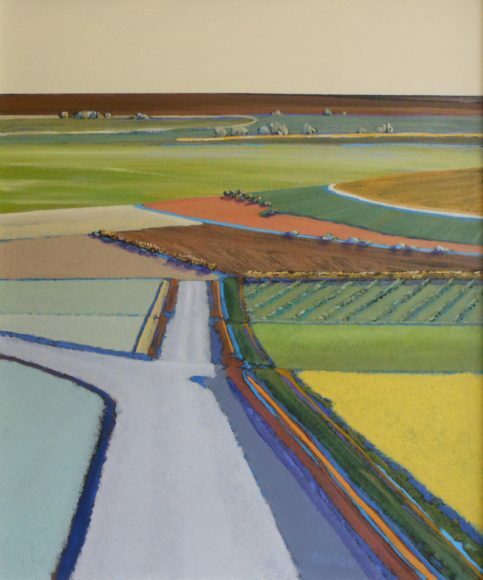 His work is included in countless permanent collections including Portland Art Museum, University of Oregon Museum of Art and The Victoria Albert Museum, London, England. 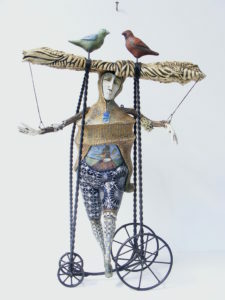 Robin and John Gumaelius, collaborating artists and husband and wife, create articulated human and birdlike sculptures. They combine ceramic, steel and wood as they form highly inventive sculptures that are often comical or bizarre. Elements of children’s stories, religious icons, reliquaries, Medieval and Renaissance history, African skin decoration and holy relics from Germany can be seen in their work.